You are currently browsing the archives for the Jeb Bush category. Hasn’t the DFL paid attention lately? 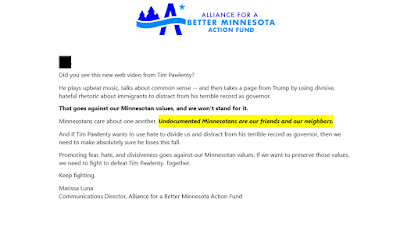 This fundraising letter says that “Undocumented Minnesotans are our friends and our neighbors.” Go to Willmar, St. Cloud, Little Falls or any town with a meat-packing plant and ask them if they see illegal aliens (they aren’t “undocumented Minnesotans”) as their neighbors. The DFL hasn’t figured it out that the average blue collar worker is disgusted with the DFL’s open border policies. BTW, this includes the rising tensions caused by the refugee resettlement program. If the DFL wants to write off rural Minnesota’s voters, they’re advocating for the right policies to accomplish that. As President Donald Trump addresses the National Rifle Association this week, a leading gun-safety group is looking to make an example out of suburban Republicans. Giffords, the organization co-founded by shooting victim and former Rep. Gabby Giffords, D-Ariz., will announce Thursday that it is adding five GOP lawmakers to its list of midterm targets and launching digital ads in 10 competitive House and Senate races, NBC News has learned exclusively. If that’s the Democrats’ strategy, Republicans should counter by highlighting the Democrats’ open border policies. President Trump stripped away the propaganda and exposed the reality of illegal immigration, especially the gangs like MS-13 and the human trafficking that people in California are seeing. The Jeb Bush ‘act of love’ image of illegal immigration doesn’t play anymore. 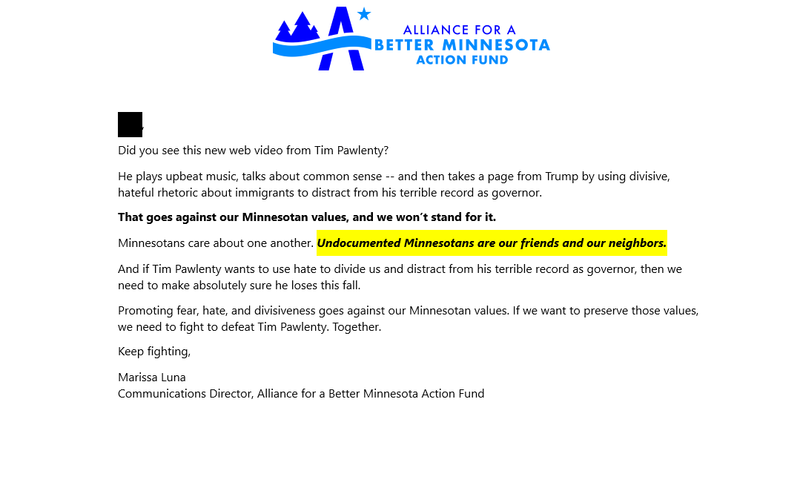 Thanks to ABM’s and the DFL’s tone deafness, they’re still convinced that illegal immigration is a winning issue for them. Rest assured that it’s a winning issue … for Republicans. While there’s no disputing the fact that large parts of the GOP rejected Jeb Bush and Marco Rubio, it’s equally true that they were significantly more qualified, and more honest, than the GOP’s presumptive nominee. Further, Trump has been rejected by a large percentage of “actual voters in the Republican Party.” He just wasn’t rejected by as many people as Bush or Rubio. First, some NeverTrumpers (like the Bush family) violently disagree with Trump on issues relating to immigration, trade, and foreign policy. In each of these key issues, however, Trump represents the traditional views of conservatives like Ronald Reagan, while the supporters of Bushism are locked into an extremist ideology that makes no sense in theory, and has been a disaster in practice. That’s breathtakingly dishonest. The only other explanation is that Ms. Ingraham is just stupid. Since she once clerked for Justice Clarence Thomas, it’s a safe bet that she isn’t stupid. Saying that Trump’s foreign policy is identical to Ronald Reagan’s foreign policy is like saying that an arsonist’s goals are essentially the same as the firefighters’ goals. First, when did President Reagan ask President Gorbachev to squash America’s enemies? When did President Reagan think it was wise to give the Soviet Union free run in the Middle East? When did President Reagan insist that we were getting screwed by other countries? When did President Reagan insist that America couldn’t compete with the world if our taxes were low and our regulations were reasonable? The answer to these questions is simple: never. Further, saying that Trump’s foreign policy is virtually identical to President Reagan’s is saying that Trump has carefully thought through what he’d do. How does that square with Trump telling a rally that he’d “bomb the s—” out of ISIS, then telling a national audience during a debate that he’d get President Putin to take ISIS out? The reality is that Ms. Ingraham isn’t being honest with her readers or with us. That’s a sad thing because she used to be a person of integrity. I wish that woman hadn’t disappeared. According to this article, Marco Rubio is already benefitting from Jeb Bush’s dropping out of the race. He’s benefitting because Bush’s fundraising team has already started writing checks to Conservative Solutions PAC, the pro-Rubio PAC. In turn, Conservative Solutions PAC has already started running their first ad. According to the article, a “pro-Rubio super PAC, Conservative Solutions PAC, released a new ad Monday, that cast Donald Trump as ‘erratic’ and Ted Cruz as ‘underhanded.’ Officials say it is part of a ‘multimillion-dollar’ campaign ahead of voting in the March 1 Super Tuesday states.” The ad takes advantage of Trump’s erratic facial contortions and his mocking of a handicapped reporter who told the truth about the protests Trump allegedly saw on 9/11. Thus far, pundits have said that Trump is politically bullet-proof, that he can say whatever he wants without losing support. That’s an untested theory thus far. Most of Jeb’s advertising and Sen. Cruz’s advertising were spent attacking Sen. Rubio. In the few times when people have attacked Trump or when Mr. Trump has spewed his conspiracy theories about 9/11 or praised Obamacare’s individual mandate, Trump’s numbers dropped precipitously. The biggest takeaway from the ad is that the pro-Rubio PAC didn’t hesitate in attacking Mr. Trump. That’s a stark contrast with Sen. Cruz’s habit of pulling his punches. For all of Sen. Cruz’s talk about fighting the “Washington Cartel”, he’s been wimpy when it comes to attacking Trump. Apparently, the pro-Rubio PAC isn’t wimpy. But on Sunday afternoon, Christie supporters heard from none other than Rubio. “The results we got last night in South Carolina were amazing. My opponents and the media had written us off, but we showed them.” began an email from Marco Rubio for President. In the e-mail he claimed the Republican contest was now “a three man race” but acknowledged “we have a lot of work to do” and solicited donations. With businessman Donald Trump rapidly tightening his grip with back-to-back primary wins, Rubio’s shot at becoming the GOP nominee hinges on quickly accessing Republican “establishment” supporters, many of which were Christie’s, who pulled the plug on his campaign after the New Hampshire primary. It will be interesting to see if this momentum helps Sen. Rubio win some Super Tuesday primaries or if this puts a dent in Sen. Cruz’s support. If it becomes clear that Sen. Cruz can’t defeat Mr. Trump, things could change quickly. That doesn’t mean Sen. Cruz would drop out of the race. It likely means that his support would drop. After Jeb Bush suspended his campaign, Sen. Rubio praised him profusely. Almost instantly, the Bush money machine started supporting Sen. Rubio. South Carolina was a damaging blow to the Cruz campaign because the state should’ve been right in Sen. Cruz’s wheelhouse. Instead, he finished third while losing support all week. As Charles Hurt said last night, if Sen. Cruz can’t win in a state rich with evangelical Christian voters, where can he win? That’s a legitimate question but I don’t want to overreact just on the basis of a single primary. What’s likely to happen, as I wrote here, is that Sen. Rubio will start picking up endorsements from reform-minded governors like Scott Walker in Wisconsin and Mike Pence in Indiana. He’s certain to gain Mitt Romney’s endorsement soon, too. When/if Scott Walker endorses Sen. Rubio, Sen. Rubio will be able to say that he proudly stands with another great pro-reform governor whose state is working infinitely better than DC. If/when Gov. Pence endorses him, Sen. Rubio will be able to deliver the same message. Most importantly, though, Gov. Bush’s withdrawal from the race raises the floor of support for Sen. Rubio. If/when Sen. Cruz withdraws, Sen. Rubio will pick up a portion of Sen. Cruz’s supporters. That’s before factoring in the negative ads that will certainly pound Mr. Trump. Jeb’s attacks weren’t sharp. They certainly didn’t put Trump on the defensive. Imagine a Rubio ad showing Trump taking different positions on different days, then Trump denying that he’s shifted in an interview with Sean Hannity. Then see a question pop up on the screen asking “Mr. Trump, were you lying the first time or were you lying the other time?” You could do that with Iraq, Obamacare and Planned Parenthood, just to name a few targets of opportunity. Thus far, the punditocracy has said that the rules of politics don’t apply to Mr. Trump. I question that because Mr. Trump hasn’t been hit with barrage after barrage of negative advertising exposing him as a liberal. Mr. Trump’s nutroots base won’t abandon him because they’re delusional. Will that apply to Mr. Trump’s sane supporters? At this point, we don’t know. It will be interesting to find out. According to multiple reports, including this article, this weekend is probably Jeb’s last political fight. His wealthy fundraisers have stopped raising money for him. His crowds are shrinking. Marco Rubio is winning the key endorsement fights. Morale is low at Jeb! campaign HQ. Other than that, things couldn’t be better. Things are getting bleak when the article includes a sentence that said “3,000 people showed up to the North Charleston Convention Center, filling just half of the cavernous exhibition hall (by comparison, the day before in a rural town of just 20,000 people, Marco Rubio had drawn more than 2,000 on a Sunday afternoon).” The half-empty convention center was for a Jeb! event. The fact that Sen. Rubio’s crowds in small towns are filled to overflowing has led some on Twitter to joke that Sen. Rubio’s big crowds are turning fire chiefs who have to deal with overflow seating against Sen. Rubio. Jeb! only wishes he had that problem. Seriously, Jeb! isn’t the campaigner that George W. was. Jeb never was in step during this campaign. He didn’t read his audience. Couple that with the pathetic ads his Right to Rise PAC put on the air and you’ve got a campaign going nowhere fast. Jeb’s ship is sinking. It isn’t that I love seeing it happen. It’s that that’s just reality. After Saturday night’s GOP debate, everyone is harping on the need to elect experienced leaders who have a steady hand in times of crisis. That’s essentially the pitch being made by the Establishment candidates. Earlier tonight, I wrote this article to highlight how insignificant experience is if you don’t share the right principles. Why would a constitutional conservative think about voting for Jeb Bush hours after he told CNN’s Dana Bash that he’d like to undo the Citizens United v. the FEC ruling? The simple answer is they wouldn’t. That’s enough to disqualify Jeb from becoming the GOP nominee. That isn’t the only boneheaded thing he’s done lately, though. Rather than running the joyous campaign he promised when he got in, instead, he attacked almost everyone in the race. The only candidate he didn’t disparage is Gov. Christie. Gov. Bush asked “We have the front-running candidate, it’s all about him,” Mr. Bush said. “And the two other gifted candidates, they’ve never had a chance to lead. Maybe they can do it, but why would we risk it?” The answer is simple. I don’t put much value on experienced people who think the Bill of Rights is antiquated. Freedom of speech isn’t granted by the government, Gov. Bush. It’s a right given to us by “Nature’s God.” In short, get your grubby progressive mitts off my right to criticize politicians. Apparently, Gov. Bush didn’t learn that constitutional republics are messy things. They’re that way intentionally. The Founding Fathers didn’t want ‘efficient government’. Dictatorships are efficient but they don’t exactly listen to the people. Mob rule democracies aren’t significantly better. Mobs have a habit of not listening to thoughtful people in the minority. For examples of this, check out Pelosi’s iron-fisted rule of the House in 2009-2010 when shoving Obamacare down our throats. One of the reasons why Constitution-loving conservatives have rejected the Establishment candidates is because the Establishment candidates don’t properly respect the Constitution. Jeb Bush just reminded us that he doesn’t respect the Constitution. Let’s hope our friends in South Carolina give him the beating he deserves for abandoning the Constitution. Saying that Jeb’s ads aren’t working is understatement. Right to Rise has spent $20,000,000 attacking Sen. Rubio. Sen. Rubio is more popular now than he was when R2R started attacking Sen. Rubio. That’s because the ads are terrible. Whatever the management of R2R is getting paid, it’s too much. They should be sued for advertising malpractice. They’re that unimaginative. They’re that forgettable. Still, it’s Jeb’s right to run a pathetic campaign and look out of touch with voters. If only coherent, in-touch candidates could run, Chris Christie would have to return to being a governor instead of playing a spoiled brat in New Hampshire. Since the results in Iowa were announced, Chris Christie has been criticizing Marco Rubio with a constant barrage. Based on the latest polling, Gov. Christie’s criticisms are failing. If things don’t change dramatically for Gov. Christie, this is likely his last full week on the campaign trail. Apparently, he knows that, which is why he’s going down throwing haymakers. It isn’t difficult to prove that Gov. Christie’s strategy is flawed. When ABC News reports that “Christie is attempting to reframe the New Hampshire primary as a race between him and Rubio in a last-ditch attempt to validate his candidacy following a disappointing tenth place finish in the Iowa caucuses and New Hampshire polling numbers floating in the single digits”, it’s reporting that Gov. Christie is fighting from a position of weakness. It’s essentially saying that Gov. Christie is operating from the belief that there are 2 lanes in this race, with Donald Trump and Sen. Cruz in the ‘Outsiders lane’ and Jeb Bush, John Kasich, Sen. Rubio and Gov. Christie fighting to be the finalist in the ‘Establishment lane’. That’s flawed analysis. There are 2 lanes but they’re the populist lane and the conservative lane. Right now, Sen. Cruz and Sen. Rubio are the only contestants in the conservative lane. “I would challenge anyone to show me the significant accomplishment that Sen. Rubio has done while he is in the United States Senate; I can’t find one,” Christie said at a news conference after accepting the endorsement of the New Hampshire Speaker of the House. Indeed, [Sen. Rubio’s] the architect of the single-most effective legislative assault against ObamaCare since its passage. Sen. Rubio’s legislation prevents the Obama administration from bailing out the health insurance industry. Most people think that’s significant. If they don’t, they should. Bush’s supporting super PACs spent almost $25,000,000 attacking Sen. Rubio in the hopes of building Bush up. Rubio far exceeded expectations, finishing with 23.1% of the vote in Iowa. Meanwhile, the guy who thinks we need “someone who can lead” finished a mere 20.3% behind the guy who Jeb thought should wait his turn. That doesn’t sound like a guy who entered the race saying that he wanted to run a joyous race. That sounds like a bitter man who didn’t see this impending defeat coming. What’s particularly insulting is Jeb’s suggestion that Sen. Rubio is incapable of leading people. Part of leadership is understanding what’s important to people, then offering a vision that inspires them to achieve their goals. If there’s anyone on the GOP side that can do that, it’s Sen. Rubio. Half the battle of leading is directing people to where they already wanted to go. People want to prosper. Sen. Rubio offers that. People want to feel safe from the advances of ISIS. Sen. Rubio certainly passes the commander-in-chief test. People have tried crippling Sen. Rubio’s campaign by saying he’s an inexperienced first-term U.S. senator. It’s indisputable that he’s a first-term senator but that isn’t a strike against him. When Barack Obama started running for president, the truth is that he was just 2 years removed from being a state senator in Illinois. He spent the first 2 years playing politics and not taking policy seriously. That isn’t what Sen. Rubio did. Sen. Rubio took his responsibilities seriously on the Intelligence and Armed Services committees. He learned national security issues until he could recite them backwards or frontwards. The Bush dynasty should go into hibernation. The American people aren’t interested in dynasties.